This award winning book (Christian choice book awards) was written to help Christian parents rise above the influences of the secular world to give their children a strong biblical foundation. You will learn how to teach your children, pray for them, love them and mark them for their divine destination. Submit your order today for a donation of only $15.00. Get a copy of Rev. 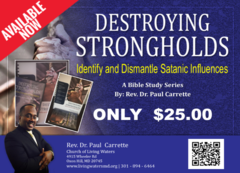 Dr. Paul Carrette's dynamic series, "Destroying Strongholds". For a donation of only $25 you will receive a 7 CD set and the series study guide. Submit your order today!